Connecting great ideas and great people through education and networking in a local, in-person setting. What are Local User Groups? Power BI local User Groups are in-person quarterly meetings that are open to Power BI users. Local User Groups are hosted by User Group volunteers (people just like you who have opted to get more involved) and are meant to foster peer to peer collaboration and knowledge sharing. With each meeting, leaders and attendees alike share best practices, practical takeaways, and real-world success stories. Power BI local User Groups help product users find efficiencies and productivity, giving them a professional edge. Where are Local User Groups? With over 200 local User Groups across the world, it is our goal to provide access and support to as many users as possible. Embrace the connections made possible by these in-person events, the empowerment gained through collaboration and the growth potential through education. Find your local chapter and get involved today. Let’s get started! Create your free account and explore the active local User Group communities in your area. 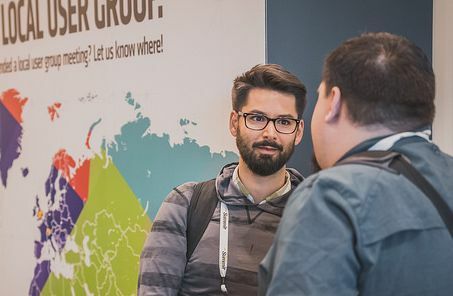 Register for local User Group meetings and connect with those like-minded peers who are ready to get and stay connected. Meet other Power BI users who work near you, and even those in similar roles to share best practices, tips and tricks, and build your support network. Sometimes the best ideas come from others who have “been there, done that” – users who work in the software daily and have overcome similar challenges you’re facing. Find valuable solutions and learn best practices that you can implement right away. Local User Groups exist today as a way for you, the Power BI end-user, to connect with others in your area using the same technology to run, manage and stay active in your business. The knowledge share that organically happens during these local meet ups is the change agent many are looking for to help positively impact their business. If you’re looking for a robust opportunity for collaboration, knowledge sharing and ultimately support, belonging to a local User Group will certainly be a positive experience. Bring your expertise to the table and share to help enrich the experience of those around you. Create your free user group account and explore your active local Power BI User Group (PUG) community. Register for local meetings and connect with others in your area. Welcome Onboard, We believe that Power BI is a game changer that can transform the way we conduct business, leverage meaningful data insights and create stunning BI reports out of different systems and data sources. Abu Dhabi Power BI User Group is pleased to welcome you. As a new member in our family, we would like to assure you that our group will spare no effort to maximize your potential and benefits. You will be entitled to attend numerous workshops, seminars and educational sessions that will help position Power BI as a market leader in BI solutions within Abu Dhabi. The contribution of each member is crucial to the continuously improve the user experience, content and value of this user group within community. Location: Abu Dhabi, United Arab Emirates. Le groupe d'usagés "Algeria Modern Excel and Power BI" a pour vocation de rassembler des utilisateurs, principalement Algériens ou résident en Algérie, passionnés d'Excel et de Power BI afin qu'ils partagent, apprennent et développent leurs compétences et leurs opportunités. Que vous soyez novice dans le monde de l'analyse ou expert en analyse et visualisation de données, que vous soyez d'Algérie ou d'ailleurs, cette communauté est pour vous. Hello, this User Group is created to learn, educate, and share fun tips in the Anchorage area. Anchorage, Alaska, AK, USA. This user group bring together all analysts, excel users and data specialists who want to do game changing things with data using the Power BI suite of tools. Auckland, New Zealand. Welcome to the Austin Texas Power BI User Group -- a group focused on sharing best practices and best ideas for deploying Power BI. We are excited to leverage the unique and diverse talent pool located in Austin to help expand the abilities of beginners and experts alike. Austin, Texas, TX, USA. Welcome on-board! We believe that Power BI is a game changer that can transform the way we conduct business, leverage meaningful data insights and create stunning BI reports out of different systems and data sources. The Bangkok Power BI User Group (PUG) is pleased to welcome you. As a new member in our family, we would like to assure you that our group will spare no effort to maximise your potential and benefits. The contribution of each member is crucial to the continuously improve the user experience, content and value of this user group within community. This group is for all users of MS Power BI who are located in Belfast but we welcome everyone who uses Power BI in Ireland. Please use this space and our group to ask questions, network, share best practices and attend events. We look forward to meeting you and to your contributions! Location" Belfast, Ireland. The Belgian Power BI user group is passionate about data and how Microsoft technologies help you store, transform and get insights into your data. Belgium, Europe. Welcome to the Berlin Power BI User Group! We plan to meet regularly to share the latest insights and tips, as well as to get to know each other and network. Berlin is the capital of Europe's startup scene, attracting talent from all over Europe in a multi-cultural and diverse environment where everyone can learn from one another. Companies who are looking to grow their Power BI expertise and reach in the valuable Analyst job market are always welcome to contact us for sponsorship opportunities. Berlin, Germany. Welcome to the Boston BI User Group! We meet every month at the Microsoft office in Burlington, MA with events from across the MS Data and Analytics ecosystem. Location: Boston, Massachusetts, MA, USA. Ahoj a vítaj ! Power BI začína byť veľmi užitočná platforma ako pre všetky veľkosti spoločností tak aj pre školstvo výskum vedu, nadšencov a jednotlivcov. Preto to treba využiť. Založili sme túto skupinu aby sme si vymieňali informácie nápady návody a možnosti a ak nám to všetkým dovolia pracovné povinnosti zorganizujeme aj nejaké tie osobné stretnutia. Bratislava, Slovakia. Power BI is the new service from Microsoft that is creating a real buzz in the analytics and business intelligence community. Business users can get data from almost any source, visualise it and share their insights. It also has great power under the covers to do sophisticated data preparation and modelling and build beautiful dashboards. Users can ask questions of their data with natural language and Power BI will do its best to answer you . The Bristol UK Power BI User Group is brand new for 2017. The aim is for members to meet every month in Bristol on a Thursday evening. We will host a variety of events including talks from expert speakers and hands-on introductions to Power BI. We aim to be a thriving Power BI community sharing experiences between end users & industry experts. Bristol, United Kingdom, UK. That’s ok! We’re here to help. Reach out to one of our knowledgeable staff to get the answers you're looking for. Start a PUG in Your Area! People are passionate about Power BI and they want to share and learn from each other. Local User Groups are a great way to network, grow your skills, discover opportunities and have FUN. Starting a group is an excellent way to exercise your leadership skills and gain extra perks as a PUG Leader. Create Your Free Account to Get Started! PowerBIUG Membership is free. Take your career to the next level by getting involved today.